Introducing Terra Marra International, a comprehensive systems integrator of environmental and water solutions with over two decades of delivering technology based solutions to challenging problems. Our philosophy and mandate is straightforward; no single treatment process can be expected to remove all contaminants, particles, pathogens and other barriers to performance. It is a fact in high purity water and quality process control systems, that the only way to achieve the closest to 100% control, is by a specially crafted multiple barrier approach for optimal protection. Better risk management and reduced liability. Healthier and safer work/asset environments. Proof of due diligence for liability protection. Maximizing your system efficiency to save money, reduce your water/energy requirements, and improve performance. Provide you with intelligent software analytics to optimize your performance and costs, including remote monitoring, alarm management and diagnostics. Water Management Surveys, Plans & Risk Assessment Services. Securing you with the most evaluated and proven Legionella management system on all water systems, coupled with monitoring services and continuous protection. Terra Marra is a global systems integrator to the water treatment industry. We craft the best in class technology in water management, systems monitoring and control, and purification from a myriad of water sources from the point of entry, optimized for each use and to the point of dispense. Terra Marra is not only a solutions provider, but also is a cadre of talent, scientists, engineers, software developers, and water technologists assembling these “pieces” and customizing the fit to our global customers on an application by application basis. 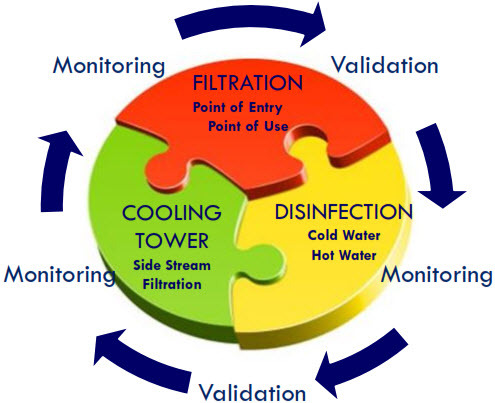 Here at Terra Marra, TMI, we provide customized systemic and evidenced based management of safe facilities water. We are rooted on evidence based scientific research and are balanced with best practices of economic merit including water and energy sustainability and feasibility in every facility and application.